LAS VEGAS – It wasn’t quite Kyle Busch’s day in the desert, but ending Sunday’s 400-mile event as the runner-up was a quencher to kick-start NASCAR’s West Coast swing. 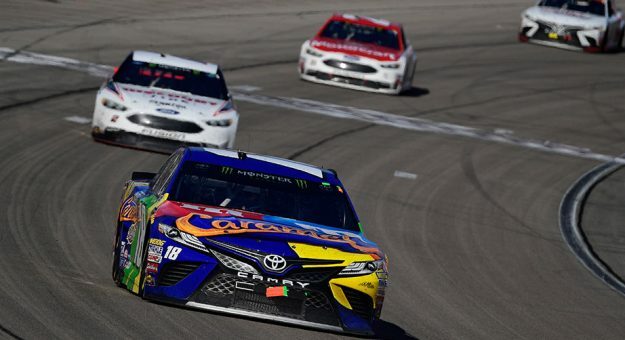 The Joe Gibbs Racing driver jumped 11 spots over the course of Sunday’s race to secure his sixth top-five finish in front of his hometown crowd at Las Vegas Motor Speedway. It wasn’t the smoothest of rides for the No. 18 team, but finding a rhythm is something Busch and his crew chief Adam Stevens have nearly perfected since joining forces in 2015. “We just didn’t have it early on, just super, super loose, but Adam and the guys made some great adjustments to flip that and be on the tight side for the majority of the rest of the day,” Busch told the media after the race. “But at least it was driveable and we could start making some passes and making some gains on people, especially on long runs when they would get loose, our car would kind of come to life and be super-fast, probably Lap 20 on into a run. After a frustrating 25th-place finish at Daytona to open up the 2018 season, Busch followed it up with a gritty seventh-place run at Atlanta. With a second-place showing now in the back of his pocket, the only thing left to do is win. And Friday’s Camping World Truck Series winner hopes that the lessons learned from the weekend will help the team in a potential playoff run in September, when the Monster Energy NASCAR Cup Series returns to Las Vegas to open the postseason. This year marks the first time in the sport’s history that the speedway will host two races in a season. “I think the biggest takeaway is just the way the race kind of transitioned,” he said. “It was a 400-mile race. The race when we come back here in the fall/late summer is going to be a 400-mile race, so the adjustments in the things that we were making today are definitely going to be useful for what’s going to happen when we come back. … Just learning how the track kind of moved around and the different lines that we were all running and stuff, it seemed like you can go about anywhere on the race track.